Courtney Crum-Ewing’s parents, Eustace and Donna Harcourt protesting outside the Chambers of the Director of Public Prosecutions. 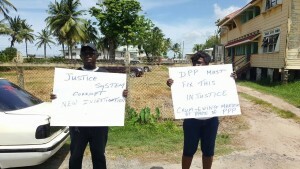 Almost one month after a man was freed of the murder of political activist, Courtney Crum-Ewing, due to insufficient evidence, his parents on Monday picketed outside the Director of Public Prosecutions (DPP) Chambers to press demands for a fresh probe and trial. They are calling on acting Police Commissioner, David Ramnaraine to conduct a fresh and thorough probe and for the Director of Public Prosecutions (DPP) to re-open the file. Regan “Grey Boy” Rodrigues was set free by Magistrate Judy Latchman on September 14, 2016, but Crum-Ewing’s parents, Donna and Eustace Harcourt vowed not to give up their fight for a fair trial so that the perpetrator could be brought to justice. “I cannot see how a murder weapon was at a man’s house and still the magistrate said he does not know anything about it. No part in the world somebody goes free with the murder weapon at their house,” Mrs. Harcourt told reporters. Crum-Ewing was shot dead on March, 2015 in Diamond, East Bank Demerara while he was on a megaphone urging residents to turn out and vote on May 11, 2015 and vote for the A Partnership for National Unity+ Alliance For Change (APNU+AFC) coalition. She said investigators appeared to have gone “soft” on Rodrigues and he did not confess to the crime. Mr. Harcourt contended that persons linked to his stepson’s death have in the past been linked to “all kinds of lawlessness” and he feared that associates of the then People’s Progressive Party Civic (PPPC) were still employed by government and were obstructing a proper probe. “It is political because I don’t know in this country that political operatives, whenever they do dirty work, like somebody is scared in this country to charge them,” Mr. Harcourt said. “The fact of the matter is that all the evidence point in the direction of the PPP and we know that all the PPP operatives are still in the position especially in the police system. How you are going to get justice when all of them are in the same place,” he added. Crum-Ewing’s mother plans to intensify the protest with the aim of getting it bigger. “I hope it doesn’t come to that. I want justice,” said his mother. Crum-Ewing, a former Guyana Defence Force (GDF) officer, had risen to prominence after he had held sustained protests outside the Attorney General’s Chambers when Anil Nandlall had been in office.